The Infinity Vase with Swarovski Elements range is the perfect gift to symbolise everlasting love. Each vase is hand cut with an infinity line and finished with Swarovski Elements. Personalise with a message up to 4 lines of 20 characters. You can also add a further line of up to 4 characters for a year. 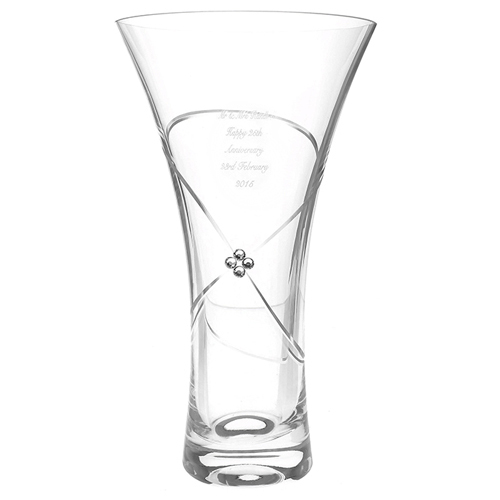 This Vase is 25cm tall and is finished with clear Swarovski Elements, making it a perfect gift for a Silver Anniversary. PLEASE NOTE: This type of glass is hand cut and personalised to order. There may be slight variations in the positioning of the infinity lines, personalisation and Swarovski Elements as they are hand finished.